First of all let’s get one thing clear right from the start, this is a whopping great novella and you have to get, read and enjoy it right now. I’ll explain why in a second, but I wanted to jump right into the deep end. It’s billed by Pro Se as part of their Young Pulp line and I have a problem with that. At the “young” age of 67, this reviewer totally sees himself as the audience for this wonderful adventure yarn. Whereas sticking a label on this paperback telling perspective readers it is geared to children is a miscue that could turn away older readers. Now that would be a shame. I have to believe that this labeling comes from the fact that the protagonist in the tale is only twelve years old. Derrick Ferguson has been writing the exploits of his hero, Dillon, for a decade now and has produced some of the finest pulp fiction ever put to paper. The Dillon books are classics, always filled with tons of action, adventure, colorful locales and amazing characters; the primary of these being Dillon himself. He’s a globe-trotting adventurer part Doc Savage, Indiana Jones and Dirk Pitt. Throughout all these amazing tales, Ferguson has hinted at Dillon’s training as a youth amongst the fabled Warmasters of Shamballah; that magical realm hidden in the heart of the Himalayas. Found half dead at one of the secret bridge entrances to the fabled city, Dillon is rescued by Kerenos Ford, the Grand Master of the Warmasters. When he regains consciousness, he learns his mother, Pamela, herself a one time Warmaster, has sacrificed her own life to get him to Shamballah. This creates a political upheaval in the strange city. In its five hundred year history no one who ever left Shamballah has ever been able to find it again; until now. Suddenly this resilient young boy finds himself at the center of a political contest between the various factions that make up Shamballah, each wanting to know how his mother accomplished the impossible. Ever since James Hilton’s classic novel, “Lost Horizons,” Shamballah has become a recurring setting in many fantasy adventures to include both pulp and comics. In most of these it is employed as a unique training ground of heroes and Ferguson does the same thing here. But his Shamballah is far from the quaint, quiet and sedate repository of ancient wisdom, rather it is vibrant, energetic enclave filled with as many dangers and wonders. None more deadly than the Roaring Forest in which young Dillon must face his greatest challenge at the story’s powerful climax. This reviewer has been a Dillon fan from day one. When news of this title was first announced, we couldn’t happier; fully expecting something truly wonderful. Now having read it, we can say our expectations weren’t only met, they were exceeded beyond our wildest imagination. 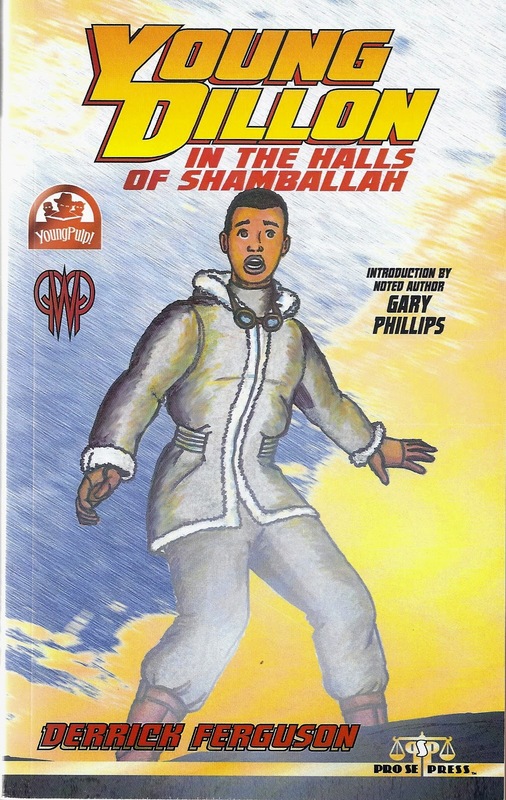 “Young Dillon In The Halls of Shamballah,” is an amazing chapter in the continuing saga of one of New Pulp’s greatest characters. Young, old, middle aged, don’t let that YA label put you off. If you love pulp action of the highest caliber, this book is for you. I guarantee it. I’m not a hundred percent sure, but I believe this is the third book in the Walt Longmire series by Craig Johnson. I’ve read, and reviewed several others and enjoyed them tremendously. Not reading the books in the proper sequence can have an unsettling effect. Somewhere in one of those I’d already finished, references were made to Sheriff Longmire and his crew having visited Philadelphia, Deputy Victoria Moretti’s home town. 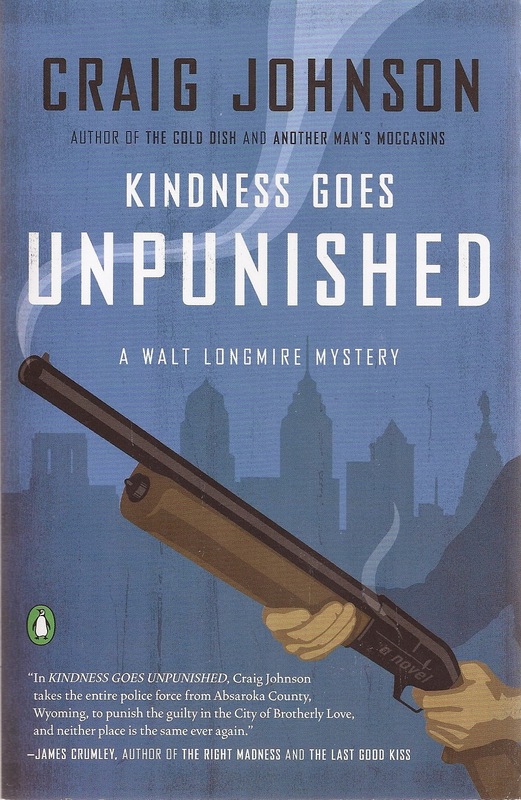 As it turns out, KINDNESS GOES UNPUNISHED is that particular adventure and as such it really an odd duck chapter in this generally superb mystery series. The charm of the Longmire books, as I’ve said in those past reviews, is their authentic Wyoming setting. Wyoming’s rugged, sparse, often times brutal nature, is a real character in the tales and such an integral element that its absence in this book is sorely felt. As the tale opens, Walt Longmire and his good friend, Henry Standing Bear travel to the City of Brotherly to visit Longmire’s daughter, Cady, an attorney who has just gotten engaged. They arrive in the city and are just getting settled in when Cady is knocked down a flight of cement stairs by an unknown assailant and the first time her father sees her is in the hospital after coming out of surgery. She is in a coma and the chances of her recovering are slim. Nobody writes emotional scenes like Johnson and he brilliantly captures the agonizing suffering Longmire endures throughout the remainder of the story as he fights desperately to cling to even the slightest glimmer of hope. It is impossible for this man, already a widower, to imagine his life without his beautiful daughter. Slowly, but methodically, Longmire gets involved with the investigation into his daughter’s attack and quickly allies himself with two very smart and dedicated Philly detectives. The pacing is brisk. When Longmire learns that Cady’s fiancé, a lawyer named Devon Conliffe, is involved with a local drug cartel, he naturally suspects him of being connected to the attack but before he can begin his investigation, Conliffe is murdered. From this point on, bodies begin to pile up and Longmire and the cops find themselves racing to find a mysterious witness who supposedly has all the pieces to the puzzle. Please don’t get me wrong here, KINDESS GOES UNPUNISHED is an excellent read and worth your attention. But in this humble reviewer’s eyes, it doesn’t come close to the others in this series. You might be able to take cowboy out of the west, Craig Johnson, but in the future, please don’t take the west out of the cowboy.